Chinese dissident Chen Guangcheng has telephoned a US Congressional hearing to plead for help in his attempts to leave China with his family. Mr Chen said he feared for the safety of his family and wanted to meet visiting US Secretary of State Hillary Clinton face-to-face. The activist is in a Beijing hospital sealed off by Chinese police. The Chinese foreign ministry, in a statement, said Mr Chen could apply to study abroad if he wanted. "If he wishes to study overseas, as a Chinese citizen, he can, like any other Chinese citizens, process relevant procedures with relevant department through normal channels in accordance to the law," Xinhua news agency quoted spokesman Liu Weimin as saying. Mr Chen had spent a week at the US embassy but left after initially accepting China's assurances of his safety. Mr Chen said that only after leaving the embassy did he fully realise the threats that had been made against his family members. Meanwhile, Mrs Clinton and Treasury Secretary Timothy Geithner are in Beijing for annual bilateral trade and strategy talks. A joint US-China news conference is expected later on Friday, but speaking ahead of a meeting with President Hu Jintao, Mrs Clinton said the relationship was "stronger than it's ever been". "We have developed a very open and honest relationship where we can discuss our differences, and we remain committed to bridging those differences whenever and wherever possible," she said. In his call, broadcast live to the Congressional hearing from a mobile phone, he said: "I want to come to the US to rest. I have not had a rest in 10 years. 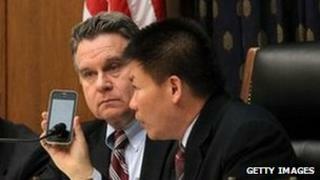 After delivering Chen Guangcheng into Chinese hands, the Americans will now be under pressure to secure his safety. Mr Chen left the US embassy in Beijing saying he wanted to stay in China. It is now clear he wants to leave. But that might not be easy to arrange. While the activist was in the embassy the US had more control over his fate than now. At the moment, the Americans seem to be finding it difficult even to see the activist, as he languishes in a hospital bed, surrounded by guards. Mr Chen came out of the US embassy thinking his safety had been assured - but it is hard to escape the conclusion that he is already in detention. "I'm most concerned right now with the safety of my mother and brothers. I really want to know what's going on with them." He said villagers who had helped him were "receiving retribution". Mr Chen told Rep Chris Smith, who was chairing the hearing at the Congressional commission on China: "I want to meet with Secretary Clinton. I hope I can get more help from her." Mr Chen's supporter and friend, activist Bob Fu, acted as translator. Mr Chen is in hospital with his wife and children but the building is ringed by police and the BBC's Damian Grammaticas, who tried to visit on Thursday, said the activist was effectively under detention. Our correspondent says guards prevented him, as well as lawyers and US diplomats, from reaching Mr Chen. He earlier told the BBC his wife had relayed to him the extent of the threats faced by his family members in his home village in eastern Shandong province. "She told me our house has been installed with seven CCTV cameras inside the courtyard. There are people in and outside of our house and on the roof... They just eat and stay in our house, and they plan to build up electric wires around my house." Mr Chen also told the BBC he had changed his mind about staying in China because he believed China had reneged on an agreement to guarantee his safety. There is no official confirmation of any such agreement, but media reports from the US suggest that Mr Chen had been promised safety in a university town elsewhere in China. The case has increasing political resonance in the US. Republican presidential candidate Mitt Romney said if reports that US officials had persuaded Mr Chen to leave the embassy were true "this is a dark day for freedom and it's a day of shame for the Obama administration". White House spokesman Jay Carney said President Barack Obama was "not concerned about political back-and-forth on this issue". Mr Carney said: "He is focused on the need to advance US interests in our broad-based relationship with China... He has and will continue to make a priority in that relationship or a part of that relationship an open and frank discussion of our concerns about human rights." The US has said that at no point did Mr Chen ask for asylum and he was never put under any pressure to leave the embassy. State department spokesman Mark Toner said there had only been telephone access to Mr Chen on Thursday, adding: "It's our desire to meet with him [on Friday] or in the coming days. But I can't speak to whether we'll have access to him. I just don't know." Chinese officials on Wednesday accused the US of interference in China's domestic affairs and demanded an apology for housing Mr Chen at the US embassy. State media have been largely quiet on the issue but a commentary in the state-run Global Times said progress in human rights ''cannot be realised in one night through a political decision, nor can it be donated by outsiders''. Another editorial in the Beijing Daily described Mr Chen as the "tool and pawn of American politicians to throw mud on China". Mr Chen was at the embassy for almost a week. He had planned his escape from house arrest for months. He scaled the wall the authorities had built around his house and was then driven hundreds of miles to Beijing. Several people involved in his escape have been detained or have disappeared in recent days. The activist has spent seven years in prison or under house arrest after he exposed human rights abuses, including the way thousands of women were forced to have abortions under China's "one-child-policy".